After a much awaited ten months, the Maalot חניכים (campers) had an amazing day of catching up with their old friends and making new ones! After saying goodbye to their parents, then חניכים learned fun new facts about each other in games led by the מדריכים (counselors). In the afternoon, the חניכים had an active day of climbing the קיר טיפוס (climbing wall), playing מחניים (dodgeball) and כדור עף (volleyball), and participating in an energetic פעולה (activity) in which all of the חניכים had to guess which fun facts matched up with which מדריך! 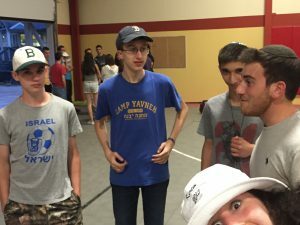 After learning all about the מדריכים, the חניכים got silly with a crazy and super goofy version of Speed Dating in which all the חניכים had to answer questions such as “Which vegetable is your spirit vegetable?” (which obviously led to a whole discussion of whether tomatoes are a vegetable). The afternoon was followed by an amazing פעולת ערב (nighttime activity) titled ערב מעלות (Ma’alot Night) in which the entire עדה (unit) was separated into 6 separate groups. 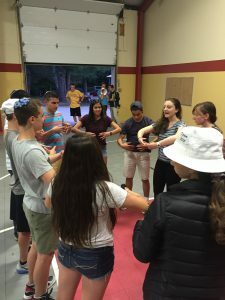 Within each group, the חניכים went around to 6 different stations that represented a different part of the summer. An example is the station that represented Maalot-Gurim buddies, in which the חניכים finger-painted like they would with their Gurim buddies. Other stations included powderpuff (a football game against Levi’im), Zimriyah, and Rikudiyah! After only one day, we can already tell this summer is going to be the best ever!